Do these covers, both by the photographer Stephen Wilkes, look similar? 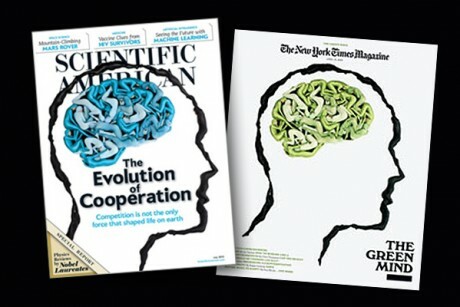 The July cover of Scientific American, titled “The Evolution of Cooperation,” touts an outline of a human head with a brain represented by tangled blue bodies. The art is nearly a mirror image of the April 19, 2009, cover of the New York Times Magazine, which featured the same illustrated head. Jonah Lehrer’s career hit a speed bump when he was discovered to be recycling his own material from earlier stories on his New Yorker blog. But Wilkes says he isn’t engaged in self-plagiarism. He says Scientific American asked him to replicate his own work for their cover. In an email statement, Scientific American editor in chief Mariette DiChristina claimed magazines often run “preexisting work” from photographers on covers and internal pages. She said Wilkes was paid by Scientific American to change the existing image, rather than to reshoot it. “In this case, we had a similar idea ourselves, but saw it had been executed in a lovely fashion by a non-newsstand weekly publication read by a general audience,” she said.